Spring and Summer are my very favorite parts of the year. As Fall starts to come in October I start with my SAD and count days til summer but it was 72 degrees today so it isn't over yet! 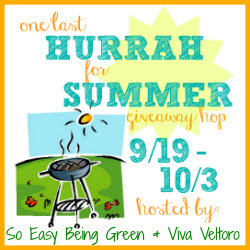 Summer is coming to a close, but we're not giving in yet – we're celebrating One Last Hurrah for Summer with this giveaway hop hosted by Viva Veltoro and So Easy Being Green! For the next two weeks, enjoy this last hurrah of the season by hopping around to all the bloggers who have come together to offer some great prizes to give away! 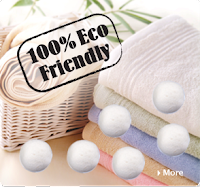 Mom To Grandma has a Set of Six Woolzies Dryer Balls for one lucky winner, Woo Hoo! Must be 18, US & CA only, sorry friends! Winner must return winning email within 48 hours! Please give the RC a moment to load. Good Luck! , the Blogging Mamas Network, and the One Last Hurrah for Summer participating bloggers are not responsible for sponsors who do not fulfill prize obligations. Hello. In a holiday gift guide, I would like to see organizing tools. Thanks. Vicki. I would like to see easy classy homemade recipes. I would love to see Toys or Clothing for baby and nice diaper bag and accessories for momma/grandma for the Holiday Gift Guide/Giveaways. I always like to see gift cards in giveaways! I also like to see products for the home, like candles or decor items. I'd like to see DIY kits- things I can make with my son for his grandparents. I would like to see gift idea for teenage girls. I would like to gift ideas under $30. Id love to see toys for a holiday giveaway! In a gift guide, I would like to see greener gifts for the whole family. Thank you! I would like to see some holiday serving platters, dishes, etc for Thanksgiving or Christmas dinners. Anything for the kitchen or candles. I would love to see easy holiday decorating ideas and kits. In a Holiday Gift Guide, I would like to see books. I'd like to see toys and baby/kid related things. A gift guide full of homemade/artisan gifts would be nice, too! I'd like to see movies for teens and books in the gift guide. I would love to see coffee items, cowboy boots, and clothing. Thanks! I would love to see Toys! Thanks so much for the fantastic giveaway! I would like to see jewelry. I'd love to see mens items. I don't see them often. Thank you! Gift cards are always good. I'd love to see Melissa and Doug toys! I would love to see kitchen gadgets or gift cards! I'd love to see a gift guide for affordable gifts or current deals to snag gifts for the hard-to-buy-for. I would like to see unique gifts for hard to buy for people and giftcards. I would like to see a variety of coffees! I would like to see a gift guide of creative gifts under for $25 or less. I would love to see personalized signs & home decor! I would love to see either a variety of kcups flavors or skylanders characters (swapforce) of toys in a giveaway! I'd like to see a slow-cooker. I would love to see some suggestions for teen and pre teen boys, it is impossible for me to come up with anything this year.